That's exactly what the people behind Sparkling ICE want to do. Sparkling ICE is the fastest-growing, non-alcoholic beverage brand in the U.S. and is on a mission to “Imagine a World without Breast Cancer”. From October 1 through October 31, Sparkling ICE will donate 1¢ per bottle of its Pink Grapefruit Sparkling ICE to help find a cure for Breast Cancer. In honor of Breast Cancer Awareness Month, Sparkling ICE has created a specialty cocktail called "Sip Pink for the Cure" using its Pink Grapefruit Sparkling ICE flavor. Grab your cocktail shaker and mix up this tasty treat. Cheers to a cure! 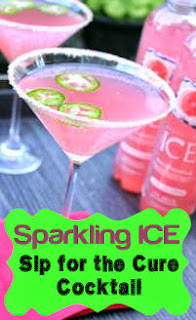 Rub the entire rim of a chilled martini glass with a wedge of lime, and dip into chili salt mixture. Garnish with a few fresh jalapeno slices.